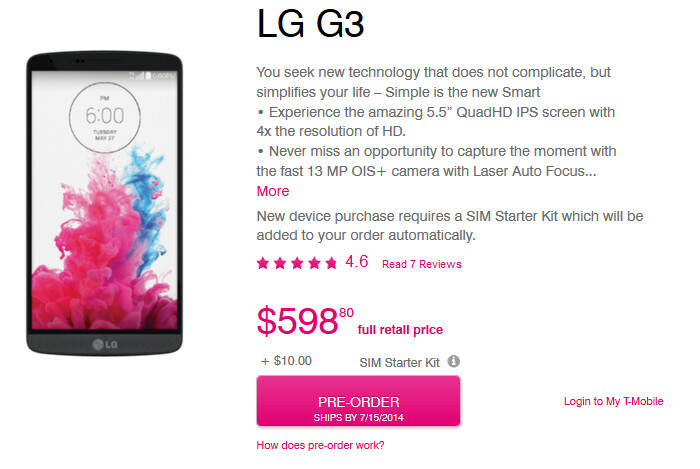 T-Mobile announced on Monday, that it has started accepting pre-orders for the LG G3. The nation's fourth largest carrier will be the first in the states to offer the manufacturer's new flagship handset. T-Mobile also gave away 28 handsets to those who won its LG G3 Open Beta Sweepstakes. 74,000 entries were received by T-Mobile. The phone is expected to ship on July 15th, and be on store shelves the very next day. The LG G3 is priced at $598. Verizon is expected to launch its version of the LG G3 on July 17th. While no announcement has been made, we expect Big Red to price the phone at $199 with a signed two year contract. 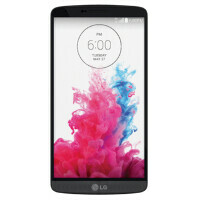 T-Mobile is offering a 25% discount to those ordering accessories online for the LG G3. To score the discount, you need to use the code SUNNYACC25 when checking out. The discount applies to a number of items including a car charger, screen protectors, car mount and a Bluetooth headset. To make sure that LG's new flagship will be in your hands next month, you might want to reserve one of these puppies right now from T-Mobile's pre-order page, which you can find by clicking on this link. I'm a poor college student right now, so although this is a great launch price I'm still going to have to wait for a price drop / sale :-/. Once again, I'm very impressed with the launch price though. The signup lists it as 2gb 32gb. I dont know if thats a special variant for T Mobile or if its just a screw up. I didnt want to pull the trigger until its fixed on their site. Yeah this is what I want to know as well... I thought for sure the 32 GB model only shipped with 3 GB ram... Why would they reduce the RAM? That would be a bad move, hopefully its a screw up. It's a typo. It's shipping with 3GB of RAM and 32GB of storage. you just going with a feeling or do you have confirmation on that? Will the T-mobile 32GB be more expensive than it is now after it's fully released in stores? Wondering if it comes with headphones like the m8. Verizon gives headphones with the m8 so that might be the deal breaker for me if the Koreans give headphones but Verizon doesn't. Its not really typical to give nice headphones with the phone but since Verizon actually gives headphones with the m8 I might be swayed to not get the g3 as much as I want it. Choices choices..